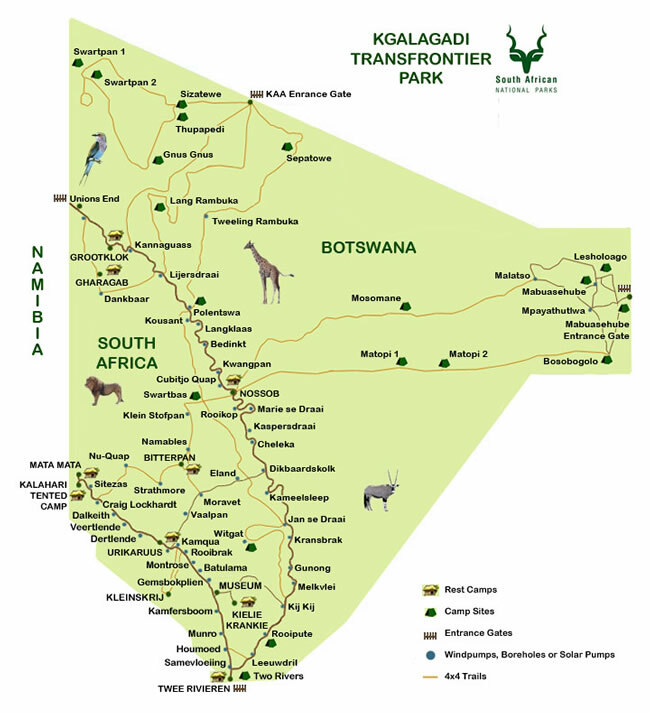 Upington – Kgalagadi Depart 830 from Upington-drive to Twee Rivieren and safari drive on a small two-track road to our camp at Rooiputs. After setting up tents we go for a game drive until sunset. Game drive to Nossob (fenced and fully equipped) Here we do game drives North and South, and visit the resident waterhole. Optional night drive with rangers in an open truck. Last change to take a good shower and swim in the pool. Kgalagadi – Game drive to Matopi after breakfast (start Mabuasehube 4×4 trail). We can see vast herds of Eland in the lovely red dunes. Early game drive to this unspoilt part of the Kalahari. We spend our time exploring the area and its secrets. This is prime predator area, and if we are lucky the big cats will visit us! Ghanzi – Central Kalahari Game Reserve. Early game drive to Central Kalahari game Reserve, which covers 52000 square km. Animals to be seen are Gemsbok, Wildebeest, Springbok and Tsesebe. Common predators are Lion, Brown Hyena, Cheetah, Leopard and African Wild Cat. 260 bird species can be seen, making it a haven for bird lovers. Central Kalahari Game Reserve. We spend our time doing several game drives exploring this huge park. Central Kalahari Game Reserve – Chobe National Park Depart to Savuti in the Chobe National Park. In contrast with the Khwai River and lush Chobe River front, the Savuti is a desert-like landscape, with herds of Elephant fighting over a dry waterhole. A pride of about 30 lions, known as ‘the elephant killers of Savuti, are residents of the Savuti area. We depart to the Chobe River through the Chobe Forest reserve.Chobe National Park is famous for its large numbers of elephant. This Park has the highest concentration of elephant anywhere in Africa-more than 71 000. Chobe is also known for its large herds of buffalo and diverse bird life. We do game drives until 10:00 when we epart to Kasane. Optional afternoon boat trip on the Chobe River, which visit the Chobe Park. Optional guided day-tour to Vic Falls. This guided tour goes through the Zambezi National Park to Vic Falls and back in the afternoon. The Victoria Falls and Zambezi National Park is a world Heritage site and Vic falls is one of the ‘Seven wonders of the world’ The falls are 1,7 km wide and nearly 550 million litres of water per minute cascade 100 m into the chasm below during the Zambezi River’s peak flow. Victoria Falls is made of five different falls. Four of these are in Zimbabwe: The Devil’s Cataract, Main Falls, Rainbow Falls and Horseshoe Falls. The Eastern Cataract is in the bordering country of Zambia. The northern border of the Park is formed by the great Zambezi River which also forms the border between Zimbabwe and Zambia for much of its length. A wide variety of larger mammals may be found within the Zambezi National Park including The Big Five: elephant, lion, buffalo, leopard and white rhinoceros. In addition, herds of sable antelope, eland, zebra, giraffe, kudu, waterbuck and impala and smaller animals can be seen. Optional activities: bungi jumping and a helicopter flight over the falls. End of tour. Excluded: Optional activities. Accommodation can vary from the itinerary depending on availability.